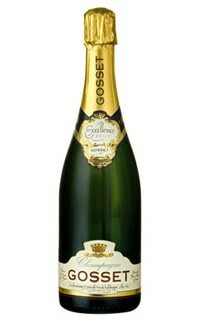 Gosset is one of the oldest wine houses in the Champagne region and still ferments the wines in small oak barrels. Comprising Pinot Noir, Chardonnay and Pinot Meunier, this affordable wine is pale golden yellow in color. The aroma is potent; Fresh floral notes give way to aromas of pineapple, guava and mango. The flavors are dense and contain earthy hints of minerals with a smooth, delicate finish. Serve as an aperitif or as a complement to fish or chicken.